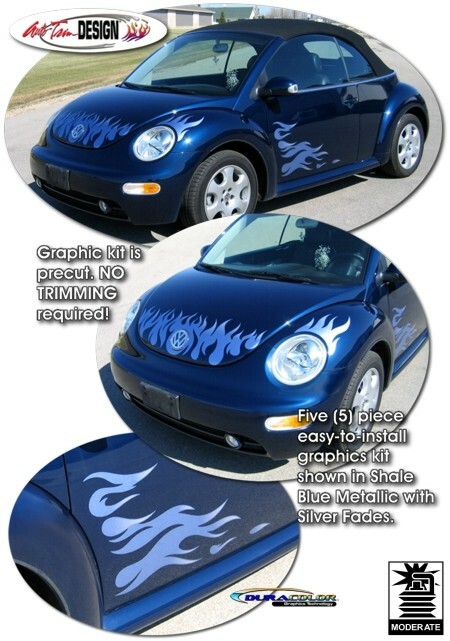 "Flame-Up" your Beetle with this awesome five (5) piece flamed graphic kit! Precut and ready to apply (NO TRIMMING required), these graphics feature a light fade to the rear of the flame tips as shown. Choose from a wide variety of base and fade colors. Graphic kit is specifically made for '98-Current Volkswagen Beetles per the Application Chart below and will not fit any other vehicle. Digitally printed with our DuraCOLOR graphic technology, kit is manufactured with premium automotive grade vinyl film materials. As a further step, graphic is covered with a 2.5 mil clear laminate which provides protection from miles of abuse. Easy to follow online general application and care instructions are included.